~~GuRu bHaI~~: Birds to fly out of foggy Cages! Birds to fly out of foggy Cages! The era of women being encountered with traditional torture practices like being beaten black and blue by a drunkard husband, carrying Cigar burnt boils on Skin, Dowry drama etc., is not majorly prevalent these days as these physical torments have transitioned to mental taunts. Neither the society nor the men make sense out of the consequences of such thin psychological disorders being undergone by today’s modern womanhood. It’s an untapped context of Indian Feminism. This reality is intensely captured by Karthik Subbaraj in his recent flick “Iraivi” (Goddess). Although the conceptualization of his thought could have been narrated deeper in the story, he had done enough justice with the portrayal of his strong characters. To grasp the message being told in his story, we need to wear a stainless mental spectacle to digest the perspective. Alright, let me not dive into delivering a review for this movie as I strongly believe that I am still a toddler to certify a movie with my viewpoint. Yet, I would paint my style of picture on the core context of the story targeted towards an unrealized takeaway. Here it goes! Three different men with different goals in their own walks of life give insignificant importance to their women. Eventually, they realize the heaviness of the pains they encompass in their lives at some point of time was proportional to the trivialness of their consideration to those women. A 60+ old man, a renowned painter, has been regretting every single moment that he had missed to listen to his wife throughout his life until she had gone to a permanent cerebral unconsciousness. What he does everyday is, to spend his time in speaking, feeding, listening, care-taking his wife which he hadn’t done when she was awake and alive. Though her brain had lost the capability to responding to any light, heat or sound stimuli, he continues this cycle with a tomb of guilt at the bottom of his heart and tears & hopes in eyes. He realizes that his only salvation would be her acknowledgement of his ‘Sorry’ which could barely happen given her cerebral condition! A 30+ young energetic movie director, Arul (son of the above Painter), has been struggling hard with his Cine industry politics in stopping the birth of his movie to the screens. He ends up in reaching the heights of dejection and frustration due to the frictions with the producer of the flick. This mental pressure of failure transitions him as a drunkard due to which he loses the reputation amongst his family and society. His wife (Yazhini) who is partially dependent and a small charming daughter had to severely suffer due to his self centered priority in life. Arul never compromise on his career next steps by parking his ego aside due to which attains the slavery of alcoholism. Yazhini had to take hard stands in her life to disconnect with this hopeless manly creature and partner with another male widow in considering her ambitious future plans and her daughter’s crucial phase of childhood. Her battle of mind every single day before taking this decision bulldozes her life terribly with deep psychological injuries. Another 30+ young man (Michel), inhibits a lifestyle of being loyal to this family as the highest priority than anything else in his life due to his early days of support from them. His loyalty is as superlative as killing a man for his boss (Arul) without even disturbed by a bothering thought about his completely dependent newly married innocent wife (Ponni) filled with tons of dreams awaiting him at home. He gets imprisoned and lets her alone with a kid for a decade. Karthik’s master stroke of the story comes, when this gentleman expects an answer from Ponni while he had questioned her whether she had shared her bed with someone when he was counting his days in prison. Ponni had pierced Michel’s manly supremacy with a rusted javelin by stating that, while she could pretend being unaware of his affair with a woman (Malar) before and even after the marriage, why couldn’t he even been not hesitant to ask this disgusting question to her. His consistent boss worship even after imprisonment eventually makes Ponni a Widow again to bring up her daughter and face the life independently ever. Now, she has to face all the odds of the society in leading an independent life as her dreams & expectations were buried deep by an uncivilized masculine animal. Another 25+ Young man (Jagan), brother of Arul, leads his life amidst the above mentioned three gentlemen. He senses the cruelty of these men from the level of importance they give to the women of their lives. He couldn’t question his dad for not listening to his mother or considering her as merely a servant maid since his childhood throughout her life, he couldn’t stop his brother (Arul) from becoming a drunkard in ruining the ambitions of his sister-in-law (Yazhini) and finally, he couldn’t bear his friend (Michel) not giving the quality of life his wife (Ponni) deserved. His frustration towards these men led him to a controversial stands yet justifying (from his viewpoint) one to propose to Ponni and assuring her the best quality of life which he can afford. This society's unethical affair engenders an hostility between the friends (Arul & Michel) and both end up losing their lives. Eventually, the story disgusts the lives of these four men for their own stains in the thoughts. Yet, the three women are still the sufferers although with compromises for the very simple reason of being emotionally dependent on these impotent men. If we contemplate on the characters of men & women in the story by parking the narration aside, they are none other than the ones we find in our home, our streets, bus stations, markets and any other private and public place for that matter. The moment we think that we want to give freedom to these every single woman who has their own unheard & untold stories of compromises, our crooked grey cells get a hard hit from a 100 Pound heavy hammer. I do not want to reiterate the superiority & the significance of a womanhood in a society as everybody is inclined to this awareness, but we are hesitant to the actual acceptance. The realization of the fact, ‘Men are no one to award freedom to women’ should get deep rooted to the upcoming generations specially to the audience who cannot imagine women out of kitchen and bedroom. 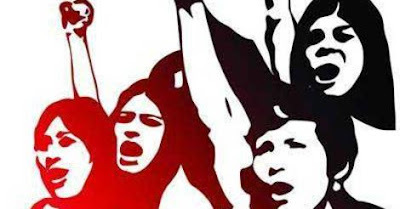 The term ‘Women Empowerment’ should be coined as not a responsibility of men to give power to women, but the right of the women to claim for power. Men dominated society is as worse as a casteism dominated one. Surprisingly, except homo sapiens, all the species consider the female ones as superior in both biological and psychological grounds. Human beings, so called the best creatures of the planet, still playing around with the thoughts towards the importance of feminism since ages. Let us first make the women to realize their forbidden rights, thoughts and freedom, then let us think about their education, empowerment, reservation etc., Let this revolution start from your mother, daughter, sister and wife. Wake up and wake them up from hibernation as it is too late to extend the debate of our thoughts and perceptions in the minds of the society. Women are like birds, let them fly out of the foggy cages which we have forced them to assume and let them learn to fight back to claim the freedom! Realize this from the PV Sindhus and Sakshi Maliks of the country who make revolutionary histories!